I am one of the lucky book bloggers that was given the opportunity to participate in the #nerdsheartya contest this year. Nerds Heart YA is a fabulous idea! As someone who really tries to use the book blogging forum to showcase lesser-known books through the use of the With Reverent Hands series and helping organize the Spotlight Series, I love the idea of an entire tournament centered on under-read middle grade and young adult books. Especially as this year's tournament is centered on underrepresented populations in young adult books- the books must feature characters who are people of color, GLBT, disabled, economically marginalized or very religious. How great is that? I am a first-round judge in the tournament, so if you'd like to see how the brackets go down, follow the Nerds Heart YA blog and see if any of the books interest you! The two books I read and reviewed for Nerds Heart YA are Blessing's Bead and Wanting Mor. Below are brief thoughts on each book and my selection for the book that I think should move on to the next round. Blessing's Bead centers around Blessing, an Inuit girl in 1989 Alaska whose mother is an alcoholic in an abusive relationship. Blessing and her younger brother move in with their grandmother in a rural Inuit community while their mother goes to rehab. There, Blessing learns more about her own culture and also about her family history, particularly the history revolving around her great-grandmother, Nutaaq, for whom she is named. I enjoyed this story, but I much preferred Nutaaq's (sadly short) story to Blessing's. Nutaaq lived through the great flu epidemic that swept the world in the early 20th century, and I really enjoyed learning about the Inuit culture in Alaska and Russia. Nutaaq was someone I would have liked to know better. In contrast, I didn't think Blessing was all that interesting. I didn't want to read about her story nearly as much, and I wish Nutaaq had her own book. I did really like the folklore that came into this story, but I think with the alcoholism, the abusive relationship, the family dynamics and the Inuit culture, the author tried to tackle far too much in Blessing's part of the novel (and it's a short book- well below 200 pages) and the story stretched a little too thin. For example, Blessing's mother and grandmother are supposed to have a very strained relationship, but this gets barely any attention at all even though (to me) it is one of the key ties in the story. I would have preferred more attention to be on the family relationships and those strains than on Blessing's difficulties with a classmate. 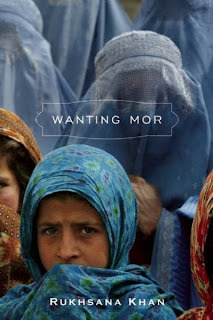 In Wanting Mor, Jameela is a young girl in post-2001 Afghanistan whose mother has just passed away. Her father turns to alcohol and drugs and takes her away to Kabul to begin a new life there. However, Jameela's new stepmother does not like her, and so one morning, Jameela's father leaves her behind at the market, and Jameela becomes one of many girls in a Kabul orphanage, where she makes friends, learns to read and write, and comes into her own. This book had a lot of heavy themes, too, packed into only about 180 pages. There is abandonment, family drama, drug abuse, women's roles, poverty and war. I enjoyed this book, but it was also difficult to read. There are many Afghani words used throughout the book- relating to clothing, food and Islam- and I think for a middle-grade reader, it might be difficult to understand these words as they are provided with few context clues (though there is a glossary in the back of the book). In some ways, I really liked this, as it implies that the reader should have a basic knowledge of a foreign culture. But it also made the book more difficult to read than necessary, and I think if there had just been some way to describe the words within the story itself, rather than requiring the reader to go to the glossary, it would make the book easier to read. I also think that this book suffered because of very two-dimensional characters. There wasn't really depth to any of them, though I think Jameela was a strong and resilient girl. Both books have a great sense of place. Blessing's Bead takes place in rural Alaska and Wanting Mor takes place in Afghanistan. The authors did well littering words and phrases describing food, clothing and conversation into their books to make them both feel very authentic. Both featured main characters who overcame impressive odds to become strong women. Overall, I preferred Wanting Mor to Blessing's Bead by just a hair, and I choose that book to continue in the Nerds Heart YA tournament. I admit I wasn't wowed or floored by either of these books, and so it was hard to determine a winner. I really liked learning about such a different culture in Blessing's Bead (particularly after reading An African in Greenland recently), but I wish the family relationships and difficulties had been explored in greater depth. While I think Wanting Mor was heavy-handed with its messages about Islam, I think the author did better in juggling so many themes in one slim volume for a young audience. I had the same problem with judging last year. I had issues with both books and one beat the other by a hair. I think it would literally have gone another way if I had something different for breakfast. I am glad to see such a wide variety of issues are being addresses in teen literature even if some of the delivery needs a little more. Nice comparison, Aarti! Too bad you got such a depressing pair to do! Blodeuedd- I wonder if they were less deep because they were middle grade fiction? I don't know. Nicole- Yes, exactly! I am not sure if I would vote the same way tomorrow, which worries me. Amanda- Well, it's pretty set aside, but it's there for sure. This is an excellent idea! I haven't read either of these, but Wanting Mor is what piques my interest as well. I've been wanting to read that book for quite some time. Judging from your review, I would have picked Wanting Mor to move on as well. I am so glad that you are involved in this tournament, and I am interested to see which books advance and which ones get blown away! Wonderfully detailed review, Aarti. I am going to have to try to check out Wanting Mor for both my daughter and myself! I love how Nerds Heart YA shines a spotlight on these little-known books. Even though neither sounds like it was entirely successful, it's good to know there are authors willing to tackle these themes and cultures. Thanks so much for being a judge this year luv. I'm really enjoying seeing such thoughtful decisions that will hopefully make everyone more interested in the books. 'Wanting Mor' is def on my radar now.